yeah, thats pretty much it. you can use most any 3 wire narrowband BOsch O2 sensor if you splice the volve harness onto it, or you can the volvo specific one with the wires for 2-3X the price. its exactly the same with my BMW motorcycle, the BMW one is $$$$ but you can use one from a Ford or whatever thats dirt cheap (its still a Bosch sensor) and splice the wires. That's slightly ridiculous! Splicing it is then! I'll be happy to have this fixed. It slightly baffles me the o2 sensor makes such a difference. be careful not to get ANYthing on the domed tip of the Ox sensor when you're installing it. splice the wires as far from the exhaust as you can get, and use some sort of high temp tape, rather than shrinkwrap, around your splice, as it gets too hot for regular electrical tape or shrinkwrap. Car runs better with both amm and o2 sensors unplugged. Is it safe to drive around this way until I get my new parts, or could it ruin something? might foul the catalytic converter a bit. I'd swap the AMM and see if that fixes it before I'd even mess with the o2 sensor. Alright. I'll probably just drive my second car until I get this problem solved. Don't care to risk messing up the cat converter. Last edited by piv15; 06-08-2013 at 03:17 AM. 240's of a given year are all exactly the same, with the exception of the back of the body, and the tire size (a wagon used a slightly larger tire than a sedan from the factory). Well, I'm back! I cleaned the AMM again, this time with the electrical cleaner (not electric motors, like you specified in another post, I think) it actually seemed to do the trick. Not entirely, but it seemed less bogged, and it came out of the boggyness a lot quicker. Fast forward to today. It was running fine for most of the day, then I went to leave town to come home, and the thing died on me while going down the street. I put it in neutral, and tried to start it. It immediately died. Then I unplugged the AMM and it started right up and off I went. Think the AMM is just shot? the electric motor cleaner sprays contain oil, and shouldn't be used for anything like this. about the only place I'd use it on a car would be on an electric motor like the starter, alternator, fan motors, etc. I've used the MAF specific spray they sell at car parts places, but I'm not really sure its of any use, or that its any different than regular electronic circuit cleaner.. for sure, hold the MAF so the electronics module side is UP when you spray it so the stuff doesn't run down the wires into the e-module. the best way to test the MAF is to swap it with one from another car. if the other car goes flakey, and yours starts running right, bingo, you know what it is. if your car remains flakey, then the problem lies elsewhere. I got a new AMM on the way. But yeah, it was electric circuit cleaner. I also greased up the terminals on the plug and AMM with some comtact grease. It was a little dry. Figured out why it was dying with the AMM plugged in. The hose behind it came off, but wasn't noticeable about it. So, my low/crappymodling issue seems all but fixed. Now, it still idles high after a while, around 1500 rpm. One question is, should the flap in the throttle body close completely? In mine there's this little gap all the time. 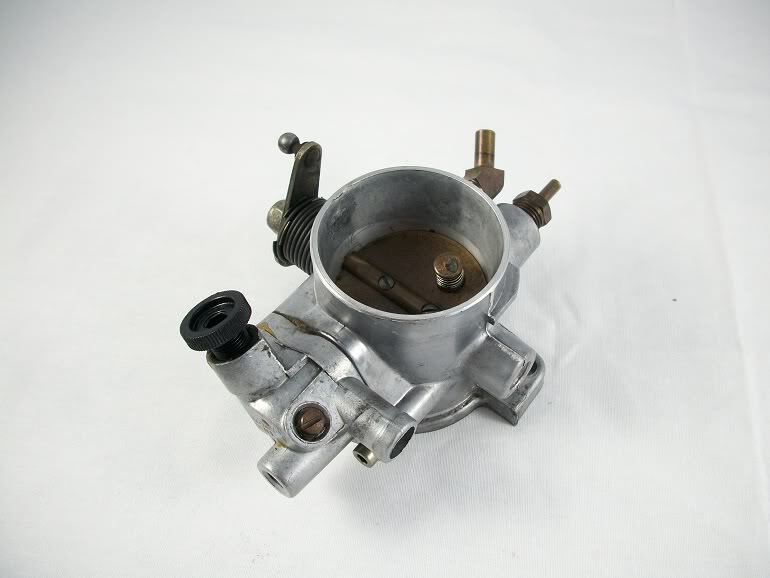 One question is, should the flap in the throttle body close completely? In mine there's this little gap all the time. Some say that it should be adjusted (via the throttle-valve-stop-screw) so that it closes as far as possible without sticking shut at all. Of course that would be AFTER the throttle-body is cleaned. Some say this same stop screw should be adjusted so there is only the faintest glimmer of light passing through the opening. Less than a hair's breadth. My Bentley manual says to adjust it so it is completely closed, and then turn the screw a half-turn further in. But, if you can actually see through the gap, or even slip a piece of paper through it, then it is probably open too far. I'll let Pierce correct me if I'm wrong. The hose behind [the AMM] came off, but wasn't noticeable. Wait! What hose is behind the AMM? Mine didn't have any hose connected to it. OK other than the main air duct. That's what I meant.. main air duct. Haha. It's just one big hose to me I guess. As for the throttle body, yes. Daylight can most certainly be seen. I assume it's letting extra air in at idle. How does one go about adjusting it? A screw? I skipped a few pages so you probably did this already...just went for the last page....but if not then try it. For the throttle body, there is a little screw. I adjusted it so it would close as far as possible. On to a new problem! I got a used AMM from ebay, put it in, tried to fire it up, and it wouldn't run. I've heard about how the system has to relearn things. Before jumping to the conclusion of it being bad, how do I get it to relearn, so to speak. I also cleaned the flame trap. I also connected a hose that was disconnected for who knows how long that's a part of the flame trap. Things are running more smoothly. Well, still have an idling issue. Here's a description of the issue in depth. When I first start the car in the day, it runs flawlessly. However, after driving it a while, when I put it in park, it idles at about 1500 rpm. This is high. Now, if I turn the car off, and let it sit about 20 minutes, and turn it back on, it idles too low. It'll actually die. After a while of that however, its idle increases back up to 1500 rpm. It only seems to do the low idle on the hotter days. However, the high idle happens countless of temperature. Haven't found any solution yet. I'll recap what I've done. Tried another AMM. Car threw a plethora of codes at me + it wouldn't like to stay running after starting it so I switched back to the old one. Cleaned & tested the IAC valve. Here are the various codes it's thrown at me. One time a few weeks ago it threw a bad o2 sensor code. Here lately it threw an injector code. I reset them to see if it turns on again. If so, it concerns me. If not, it doesn't concern me. Although, I'm thinking of replacing the o2 sensor next. However, anymore advice could be great. I'm just wanting to get at least the low idle + dying problem fixed. The high idle isn't great, but it is slightly hard on the transmission. random codes like that suggests to me its a more systemic problem, like funky wiring, or bad grounds/power to the ECU. Why would the temperature make a difference though? The low idle only occurs when it's hot out, about in the 80's and up. Plus, it threw the injector code when the idle was in the rough. my redbricks all idle rock solid at 600-700rpm or so. my 740 turbo stutters a bit and recovers when the AC kicks on, I probably need to R&R its IAC, but its not bad enough to need it. when they are cold started, they idle at about 1000rpm, and a few minutes later when they are partly warmed up, 600 or 700.
for it to idle at 1500rpm, something seems badly adjusted. are you sure there's no air leaks in the plastic pipe from the AMM to the throttle body and on to the manifold? even intake manifold gasket leaks could cause an unstable idle and the ECU to overcompensate.